The wine must be at least as sweet, maybe a bit sweeter, than the chocolate your are serving it with. Although there are exceptions, red wine is your best bet. The "go to" wines are Cabernet Sauvignon and Zinfandel. The stronger the chocolate, the more full-bodied the wine should be. Lighter, more elegant wines pair well with lighter bodied wines. The darker the chocolate, the more likely it is to pair well with red wine. White chocolate is a tricky pairing. Spanish Sherry or Moscato are your best bets, picking up the creaminess of the chocolate. 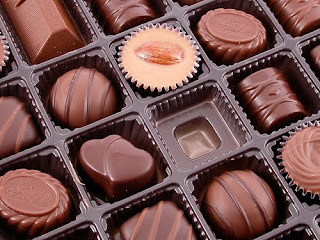 For milk chocolate you can try champagne, Riesling, a Pinot Noir or light bodied Merlot. Dark or bittersweet chocolates need a wine with a more robust flavor, perhaps with chocolate flavor notes of its own. Cabs and Zinfandels are close to the perfect dark chocolate match. If you are considering something special for Valentine's Day, this is the way to go. A Pinot Noir or a Merlot can handle dark chocolate around the 55% cocoa mark. A Tawny or Vintage Port is a balanced approach to a dark chocolate dessert or truffle. Try a D.I.Y. wine and chocolate pairing. Buy a few bottles of wine and several quality chocolate bars or truffles and experiment.